An ASIC Company Extract is designed to help you verify the legitimacy of an entity by providing details about a company and is good for companies looking to make low-risk decisions. This can come in the form of a Current Company Extract, or a Historical Company Extract. The ASIC Historial Company Extract will include all the details in a Current Company Extract plus any prior details relevant to the type of organisation. Annual returns were abolished on 1 July 2003, however, previously lodged returns will still show on Historical Company Extracts. Ordering your ASIC Company Extract from InfoTrack gives you three times the value at no additional charge. 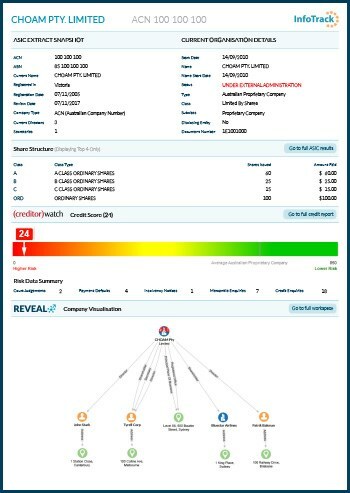 Each ASIC Extract you order from InfoTrack returns a single PDF including the Extract, a CreditorWatch Credit Report and a REVEAL data visualisation workspace. These additional features provide you with a more detailed picture of the company you're searching, allowing for deeper levels of due diligence. Assess the credit worthiness of the company you're searching through a snapshot of the its credit history. 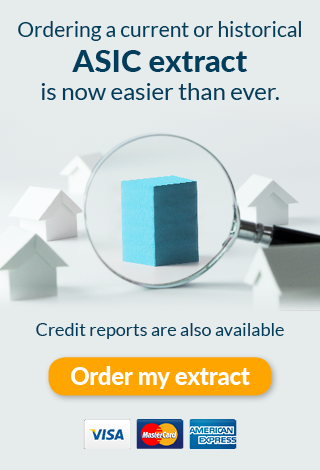 The Credit Report details risk data associated with the company including court judgments, payment defaults, insolvency notices, mercantile enquires, credit enquiries and credit score. Order an ASIC company search today.